I won’t go into a lot of detail on the history behind this gun. 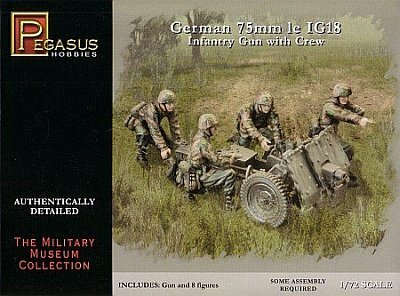 Suffice it to say, the 75mm leIG18 was introduced into the German Army in the early 1930s as a close support weapon for infantry units and was used throughout World War Two. The kit’s parts come on two sprues. One sprue holds 32 parts for the gun molded in hard plastic. The other sprue is of soft plastic containing the figures (8 gun crew in total) plus their kit and weapons. 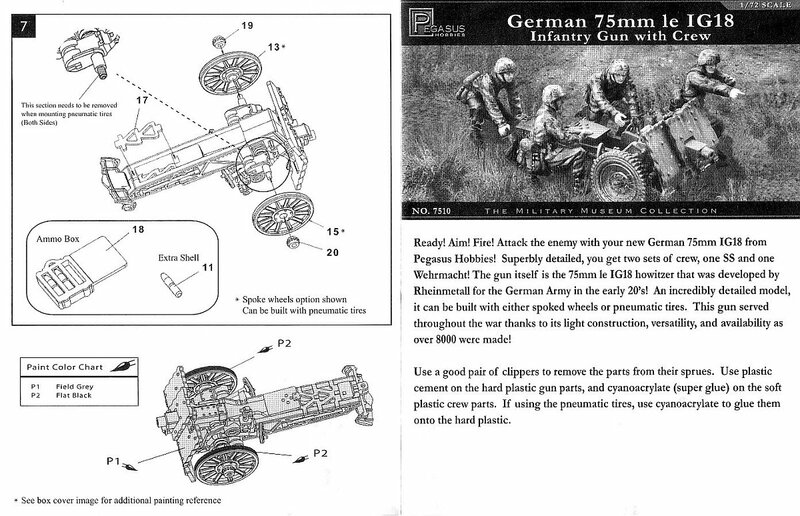 On this sprue there are also three gun related parts for two optional wheels plus an open ammo case exposing 3 rounds. 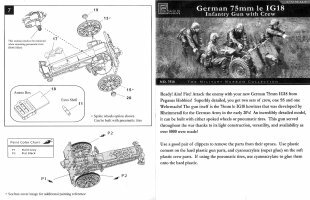 The modeller has the option of two wheel styles: steel rimmed spoked wheels intended for horse drawn transport (hard plastic) or pneumatic tire wheels for motor vehicle transport (soft plastic). My review will only concern itself with the gun. Instructions are simple and easy to follow and you can pretty much follow their steps as laid out. Gun parts are molded very well with nary a seam or sink mark to be found. 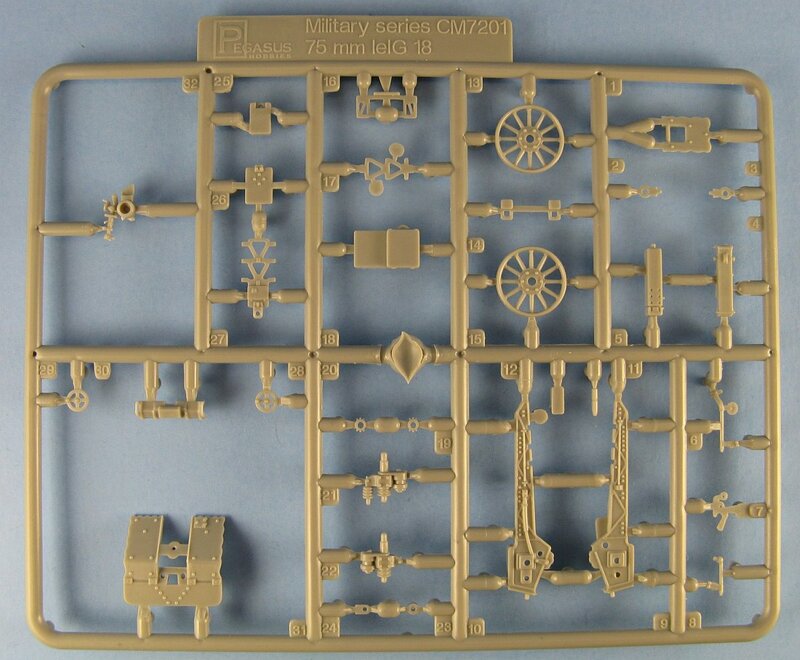 It’s unfortunate that Pegasus decided to put the extra wheels on the soft plastic sprue. Construction is straight forward. I chose the spoked wheels option, assigning the pneumatic wheels to the spares box. 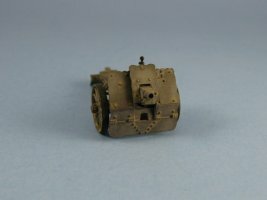 I only made two simple modifications to the kit. First was some thinning of the shield edges with some judicious scraping with a hobby knife followed with some sanding to smooth everything. The other was to drill out the barrel opening to deepen it and make it look more realistic. 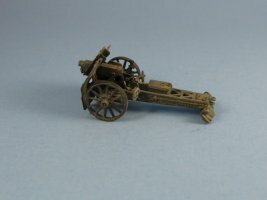 I found it easier to build the gun in four separate assemblies - carriage, wheels and barrel. I left the small traverse and elevation wheels off (added in steps 2 & 3), as well as the sights (added in step 3), until the end to prevent them from being broken or lost during painting. 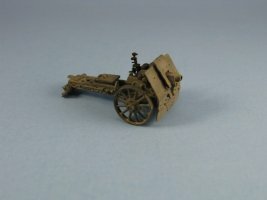 The instructions provide overall gray as the sole painting option, which is the one I chose for an early war horse drawn weapon. I suppose it would be equally valid to paint the gun later war yellow, or even yellow with brown and green patches, especially if the modeler chooses the pneumatic tire option. As for the figures, they look quite nice to my untrained eye, though they are molded in soft plastic and do show some very fine seam lines. For a review of the figures I suggest that the reader visit the Plastic Soldier Review site. 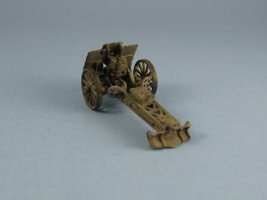 There are no instructions for painting the figures, so it is left to the modeller to find the colours for these for himself, or use the box top artwork as a guide. A nice little kit overall. Fit is great. Molding is great. Modifications required are few. With age comes wisdom, or so they say. In my case it took four years to realize that this review is slightly in error. 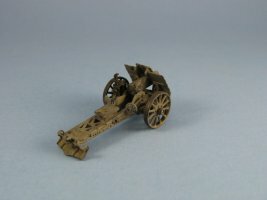 This problem concerns the gun's suspension and the associated wheel choices. 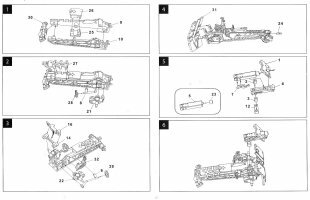 Though the kit gives you two offerings for wheels, unfortunately the suspension layout is only valid for the pneumatic wheel option. 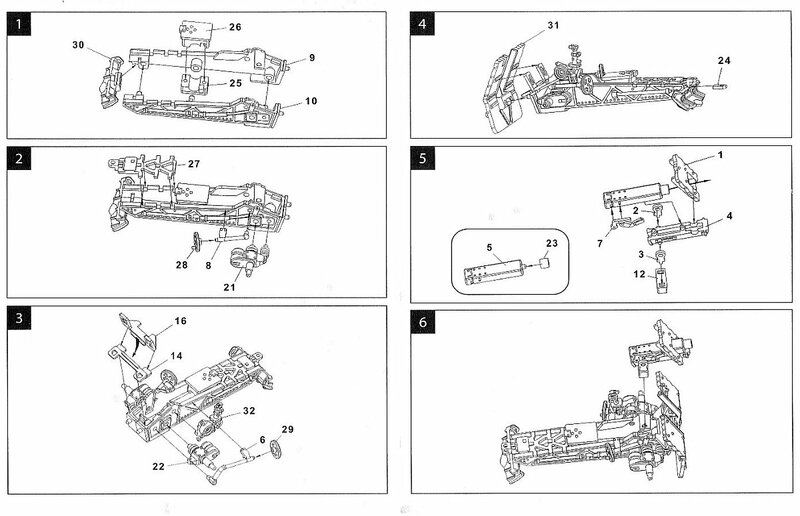 If you choose the spoked wheel, as I did, the axle will need to be changed to a solid axle, as seen in reference . And the axle lengths differ. The solid axle for the spoked wheels is shorter, placing the wheels completely behind the outer edge of the shield, while the pneumatic axle is longer and the wheels are well outboard of the shield's edge. Finally, guns used for motor towing with the pneumatic tires also have a brake light mounted to the right front of the shield. Alas, my model is incorrect and I will need to rectify the problem sometime soon, most likely to be done as a completely new build, with replacement pneumatic wheels for the kit's soft plastic offerings.